Rottweiler Paddy is a huge favourite with staff at Dogs Trust Shoreham. The nine-year-old male is happy to mooch alongside staff for a little stroll out and about, followed by a snooze on a nice comfy bed. Tracey Rae, rehoming centre manager, said: “Paddy is a special boy looking for an adult-only home without visiting children, where he can chill in his very own garden and be spoilt to bits. 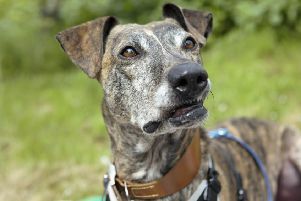 “He is unable to live with cats or caged animals but is friendly with other dogs and will enjoy meeting up with play friends when out on his walks. Paddy’s canine carer has taken him to the beach recently for a little dip in the sea, which went down well. Contact the Brighton Road centre on 01273 452576.